Alfalfa sprouts are high in fiber and can be a healthy addition to the diet. However, commercially-grown alfalfa sprouts carry many risks. If you want to eat sprouts, consider buying organic seeds and then sprouting them at home. This will prevent the bacterial contamination that makes alfalfa sprouts dangerous. In April 2009, the FDA issued a warning that alfalfa sprouts might be contaminated with salmonella. While this particular warning was tied to an outbreak in six states, this wasn't the first time contamination occurred. In fact, the FDA has issued several similar warnings over the previous 20 years. Because you don't cook alfalfa sprouts, there's no way to kill the salmonella bacteria. If you ingest it, you might experience fever and diarrhea. Serious cases can require hospitalization and might be life threatening. Besides salmonella, another common bacteria found in alfalfa sprouts is E. coli. Some strains of E. coli, such as the E. coli O157:H7 strain, can seriously damage the intestine and might lead to kidney failure, blood loss and even death. Outbreaks are common and the Center for Disease Control (CDC) warns that infections can be potentially fatal if you don't seek medical attention. Children, the elderly and people with compromised immune systems are especially at risk. 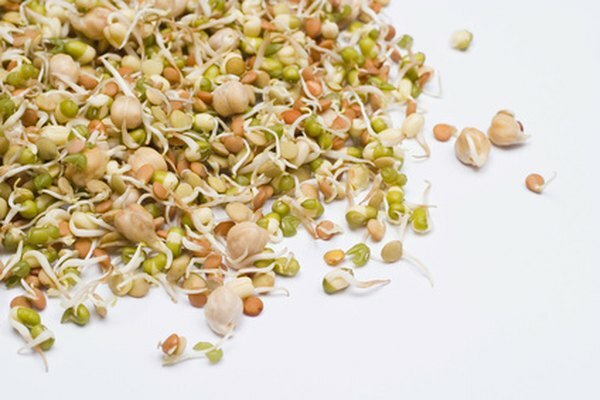 Alfalfa sprouts contain canavanine, a toxin that can attack the immune system. In humans, it might cause a reaction similar to lupus. This might or might not disappear after you stop eating the sprouts. A large amount of alfalfa sprouts are required to trigger this reaction. However, people who eat a raw diet or frequently add alfalfa sprouts to juices or smoothies might be at risk. Pregnant women should avoid raw alfalfa sprouts at all costs. Salmonellosis, caused by the salmonella bacteria, can result in miscarriage. Cooked alfalfa sprouts are safe, but only if stir-fried or cooked well. Slightly cooked sprouts are unsafe. Anapsid.org: Are Raw Sprouts Safe To Eat?